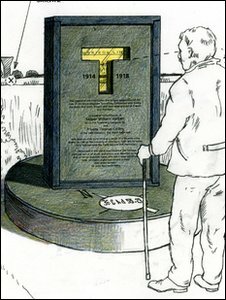 Efforts are being made to trace the descendants of a Swansea soldier whose story helped inspire a memorial to tunnellers killed in World War I.
Thomas Collins was working 40ft under no man's land in June 1916 when a German mine exploded and despite a remarkable rescue attempt was entombed. Tunnellers worked underground to blow up enemy trenches. The first memorial to the work of the tunnellers is being unveiled in Givenchy, northern France, in June. It is hoped to invite his descendants to the ceremony. Historian Peter Barton, who has written a book about the tunnellers, is behind the small team that has made the memorial possible. The job of the tunnelling companies was to dig below the enemy trenches and blow them up while stopping the Germans doing the reverse. Many tunnellers were miners - with many thousands drawn from Wales. They were at permanent risk of being entombed, suffocating or even drowning. "They all faced and experienced the same horrific dangers - it was the most appalling job on the western front," said Mr Barton. He said the story that has captured many imaginations was that of Thomas Collins and William Hackett. They were working 40ft under no man's land in the Givenchy sector, in northern France with a party of three other men when on 22 June 1916 a heavy German mine detonated destroying part of the tunnel, cutting the five men off from the shaft and safety. A rescue party was immediately organised and after two days of digging an escape hole was formed and the tunnellers contacted. Three of the men were helped to safety but Sapper Hackett refused to leave until Private Collins, who was seriously injured, could be rescued. Due to German shelling and mortaring of the shaft-head the gallery collapsed again, entombing the two men permanently. Sapper Hackett was the only WW1 tunneller to be awarded the Victoria Cross. Because the work of the tunnelling companies was a state secret for many years Mr Barton said they have never received the recognition they deserved. "Theirs is a forgotten story as their war was very much a hidden war," he said. Donations have come in from across the world for the memorial since the appeal started. "I've been wanting to do this for years because they seem to have been inadvertently overlooked," he added. Mr Barton said he hoped descendants of both Sapper Hackett, who are known, and Private Collins, who are named on the memorial, would attend. The 1901 census shows Thomas Collins living at 5 Castle Walls in Swansea. The 1911 census shows him as a worker in a bottling factory, living with his dock labourer father, stepmother and six brothers and sisters. 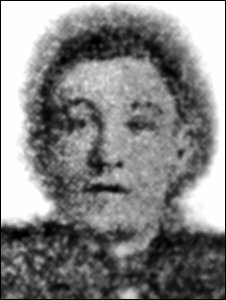 He was 22 when killed in June 1916 and his father and stepmother lived at 58 Colbourne Terrace in Waun Wen after the war. Electoral rolls and phone books have a Collins family member living at that address in 1950 but nothing can be found since and the house was demolished in 2001. "To have relatives from both the families would be marvellous but the relatives of any of the tunellers are very welcome to attend," added Mr Barton.